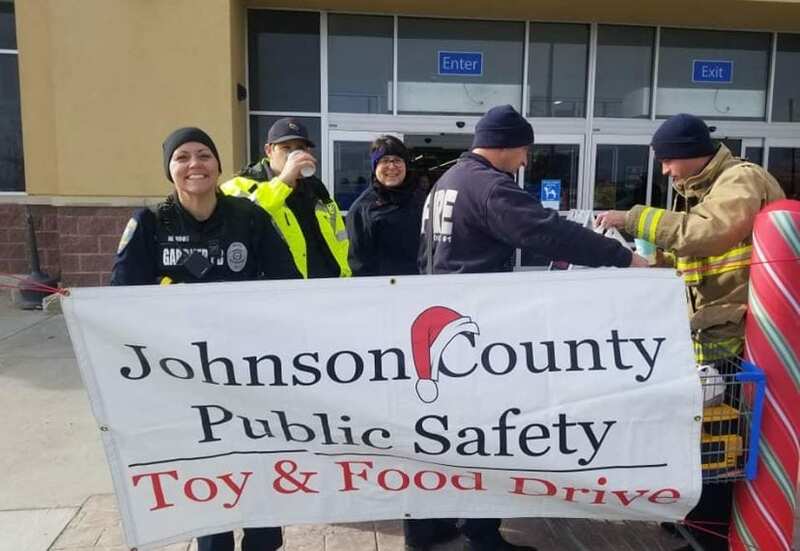 This past weekend at the Johnson County Public Safety Toy and Food Drive, enough toys were collected to fill 24 bins, with each bin holding approx. 64 cubic feet of toys. This was the 16th year GPD participated in the JCPSTFD . Beginning in 2003 with one Walmart store in East Olathe, the program has now grown to include five Walmart stores – two in Olathe, one in south Overland Park, one in Gardner and now one in western Shawnee. Employees from Gardner PD, Shawnee PD, Overland Park PD, the Johnson County Sheriff’s Office, Johnson County Med Act, Johnson County Fire District #1, Olathe Fire Department and Shawnee Fire Department all work through the weekend the week before Thanksgiving to collect toys and food from customers we solicit at these Walmart stores. At the same time, families in need across Johnson County apply to be part of the program via an online application. All of the collected toys are transported to a central site where they are sorted by age group. The food is stocked and divided into equal parts to be provided to local food pantries. Once a final list of program participant families is completed, toys are gathered for each specific family and are then distributed to that family just before Christmas, when they come to our distribution site and see Santa and Mrs. Claus.